How are we going to find a solution to the stalemate consequent to the failure to ratify the constitutional treaty? It is not really realistic to try at all costs to gain the approval of the text as it stands on the part of the two countries which voted "no" and the seven countries which have interrupted the ratification procedure. Seeking an agreement on a shortened text is not a convincing solution either: the constitutional treaty is a whole and each of its parties – contrary to a persistent myth – contains provisions of major importance. Should we try to make the best of the situation and try to move forwards keeping the treaty as it is? Attempts to do this for the last year do not appear to have been conclusive. But Europe cannot satisfy itself with failure: the dynamism launched half a century ago would thereby be affected. To be credible a solution must take into account the fact that two thirds of the Member States have approved the constitutional treaty; but the concerns that were expressed during the referenda in France and the Netherlands cannot be ignored either. Hence we must find a solution which will both enable the rescue of the content of the constitutional treaty and yet show worried or reticent citizens that their message has been received. In the face of stalemate Jean Monnet advised a shift and refocus in the debate. We must now adopt a new approach which "says" more to the citizens. The Union is not France of the IVth Republic whose institutions were so discredited that everyone acknowledged the priority laid in changing them. Institutional reforms are certainly necessary but it is joint projects which are of interest to European citizens and which can bring them together. Institutional questions must therefore be closely linked to the definition of precise objectives to pursue. On some points a community of objectives still has to be created amongst Europeans: what is the future of the enlargement procedure to be? To what degree should economic, social and territorial cohesion be pursued for the Union? 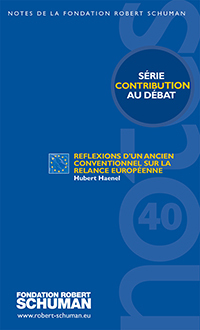 How should the relation between European identity and national identity be considered? For subjects such as these previous discussion is necessary. However there is already a wide consensus with regard to certain objectives which correspond with obvious expectations on the part of the citizens: the improvement of economic and social governance, the more effective fight against cross border crime, the enhancement of the Union's external activities, the clarification of responsibilities between the Union and the Member States. However and this is the vital point, the constitutional treaty contains many measures which will make it possible to better achieve these objectives. These measures might be taken up in an intermediary treaty in a new form where they appear clearly as the necessary means to achieve the goals that meet with a consensus. Most of the progress put forward in the constitutional treaty might be preserved in this manner and possibly adapted or completed when, given the debates on ratification, it appears necessary to go further in order to meet citizens' expectations more satisfactorily. An intermediary treaty like this might enable the rapid relaunch of European construction along the lines of a small number of consensual goals. construction, which might be undertaken within a new Convention – the adoption of a fundamental treaty in which the parts of the constitutional treaty that had been so far set aside could be examined again within a wider frame.